The Greenpatrol "Technology Watch" provides an overview of web resources with highlights, news and trends of the related technologies involved in the Greenpatrol Robot project. Greenpatrol is one of the first project to use GNSS for indoor positioning. Systems to locate objects or people inside buildings use lights, radio waves, magnetic fields, acoustic signals or other sensory information collected by mobile devices. There are several commercial systems on the market, but there is no standard IPS system yet. WIFI based systems seem most successful at the moment and they will be Galileo’s main competitor the coming years. 1 Industrial robots can do more and more complex, repetitive tasks. They get cheaper, can perform more complicated tasks, become more versatile. In the automotive sector they are already widespread and dominant. In other areas, especially agrifood, increased use is expected. Industrial robots are more and more visible to consumers; instead of being backroom groomers. By bringing industrial robot workers to the front line of customer services, businesses are familiarising consumers with the concept of robots as workers, to overcome the mental bias held against robotics by some. Collaborative robots are a different breed of industrial robot that are specifically designed to work alongside human employees across supply chains. Collaborative robots are cheaper on face value, built with human cooperation in mind (they have built-in security), and are therefore easier to program. An important phenomenon in the robotics sphere is the development of soft robots. They are developed to work in real world environments and could be used for industrial applications that must be done in a turbulent environment or require delicate handling. The main obstacles to industrial robot installation include the time and expertise needed to teach them and program them. In virtual environments, human teleoperators perform actions that the robot then copies, eventually applying the knowledge in real life. Imitation learning, as the technique is called, enables a single robot to absorb numerous skills in a low cost, low to no risk environment. Autonomous robot farm; Iron Ox, based in California, launched America’s first autonomous robot farm in the hopes that artificial intelligence (AI) can remake an industry facing a serious labor shortage and pressure to produce more crops. 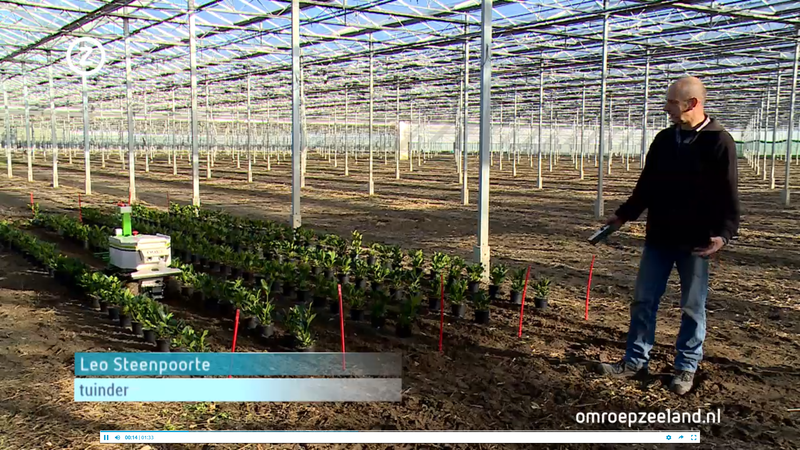 Robot Oz works in the operational greenhous of grower Leo Steenpoort from Oosterland. The robot helps Leo with work in the greenhouse. Weeding and in the future also sowing. Work that people prefer not to do. "We are falling short on labor in the agricultural sector, this robot can be the solution to this problem, and Oz weighs a lot less than the average tractor, making it less damaging to the soil." The farmer bought Oz in France. It was an investment, but it turns back. "He does not smoke, does not take a coffee break, is never ill and can work at night, he only has to be charged once in a while, and in that respect it's just a real employee." The robot has a side wise looking Laser to detect the distance to the crop and calculate his route and two cameras to detect the green parts of the crop. Robot vision (also called computer vision) is very closely linked to machine vision, which can be given credit for the emergence of robot guidance and automatic inspection systems. An influx of big data i.e. visual information available on the web (including annotated/labeled photos and videos) has propelled advances in computer vision, which in turn has helped further machine-learning based structured prediction learning techniques at universities and elsewhere. Extrasensory technologies like radar, lidar, and ultrasound, are also driving the development of 360-degree vision-based systems for autonomous vehicles and drones. Bayesian or probabilistic models are a common feature of this machine learning approach. Machine learning is a field of computer science that uses statistical techniques to give computer systems the ability to "learn" (e.g., progressively improve performance on a specific task) with data, without being explicitly programmed (https://www.techemergence.com/machine-learning-in-robotics/). According to a recent survey published by the Evans Data Corporation Global Development, 24.7 percent of all developers of robotics apps indicated the use of machine learning in their projects. Deep learning is a special kind of machine learning. Deep Learning is about learning multiple levels of representation and abstraction that help to make sense of data such as images, sound, and text with special algorithms. The system itself can reach a higher level of abstraction and therefore is also a stepping stone for Artificial Intelligence. If you know a good resource with up to date information on GNSS guidance, Robotics, Greenhouse Automation, Vision systems, or related, please let us know!